The sea gull, even without official status, was long considered the state bird of Utah due to its storied role as a protector of crops. It gained this reputation during the summer of 1848 when swarms of crickets attacked pioneer food supplies. It was reported that flocks of the birds arrived, settled in the "...half-ruined fields" and "gorged themselves" on the attacking crickets. It's often stated that the sea gull was made the state bird in return for saving the settler's lives. It was a long way from 1848 but, over 100 years later, a bill was introduced in the Utah House of Representatives by Richard C. Howe promoting the California gull as the official state bird. The bill was approved by the Utah Legislature and Governor J. Bracken Lee signed the legislation adopting the sea gull as the official state bird on February 14, 1955. The statute does not identify a particular species, but official Utah websites consistently and emphatically identify the state bird as a California gull (Larus californicus), even remarking that the statute itself only identifies the state bird as a generic "sea gull." Note: The state bird is the California Gull, however Utah Code generically lists it as the sea gull. Shearer, in his 2002 edition of State Names, Seals, Flags, and Symbols , displays a similar inconsistency by referring to the state bird as a "sea gull" and citing it as Larus californicus. Shankle, though about 20 years ahead of the official act, is consistent. In his 1934 book, he refers to the "unofficial at the time" state bird as Larus californicus, the California gull. Perhaps the 1955 legislature simply thought, "If it looks like a sea gull, walks like a sea gull and flies like a sea gull, it must be a sea gull?" "The gull is considered the state bird of Utah by common consent, probably in commemoration of the fact that these gulls saved the people of the State by eating up the Rocky mountain crickets which were destroying the crops in 1848." "when it seemed that nothing could stay the devastation, great flocks of gulls appeared, filling the air with their white wings and plaintive cries, and settled down upon the half-ruined fields. All day long they gorged themselves, and when full, disgorged and feasted again, the white gulls upon the black crickets, list hosts of heaven and hell contending, until the pests were vanquished and the people were saved." "to the lake islands whence they came." The following information is excerpted from the Utah Code , Title 63, Chapter 13, Section 63-13-5.5. All of Utah's state symbols are listed in section 63-13-5.5. Below, we have listed only the entry regarding the official state bird. TITLE 63 - STATE AFFAIRS IN GENERAL. CHAPTER 13 - MISCELLANEOUS PROVISIONS. Larus californicus (California Gull): University of Michigan Museum of Zoology: Animal Diversity Web. Birds of Utah: Field Guide: by Stan Tekiela. Birding Utah: D. E. McIver offers a guide to over 100 birding adventures across the state. 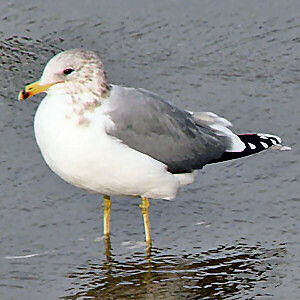 Source: "Utah State Bird - California Gull." Pioneer: Utah's Online Library . The State of Utah, 2011. Web. 2 Nov 2011.